Siemens PLM Software is celebrating 30 Years of Femap with a brief video history. [I remember seeing some of those early ads in print magazines.] Congratulations to our meshing friends from the structures side of the CAE world. 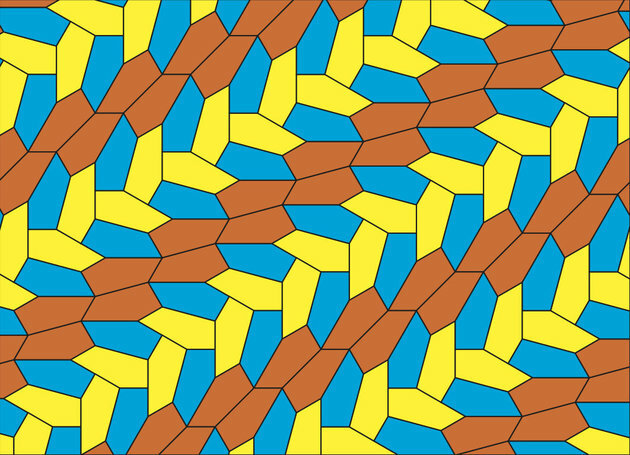 You can add this newly identified irregular pentagon as one of the types of polygons able to tile a plane. Image from HuffPost Science. See link above. Flow Science published the list of presenters for the upcoming 2015 FLOW-3D Americas Users Conferences. Wilde Analysis in the UK is offering a software-neutral Introduction to CFD Principles seminar on 15 September. The U.S. Army seeks someone with a PhD to do CFD at their Biotechnology High Performance Computing Software Applications Institute in Maryland. CAESES 4.0 includes many new capabilities for axial blade design. simFlow 2.1 was released with four new solvers, support for large meshes, and more. In other FLOW-3D news, they’ve decreased the runtime of their solver by more than 50% in some cases. CFD for the Batmobile courtesy of Autodesk Simulation. Click image for video. There will likely be a need for CFD to evaluate the impact of closed cockpits on Formula 1 cars. Intelligent Light shares their thoughts on the visualization aspects of the CFD Vision 2030 Study. STAR-CCM+ was used to model blood flow for a new stent design. Software Cradle shares a case study of the use of scSTREAM for architectural design. Image from Software Cradle. Click image for article. I first discovered Ben Butler’s room-sized grid on Colossal and immediately began looking forward to my next trip to Houston so I might see Unbounded myself at the Rice University Gallery. 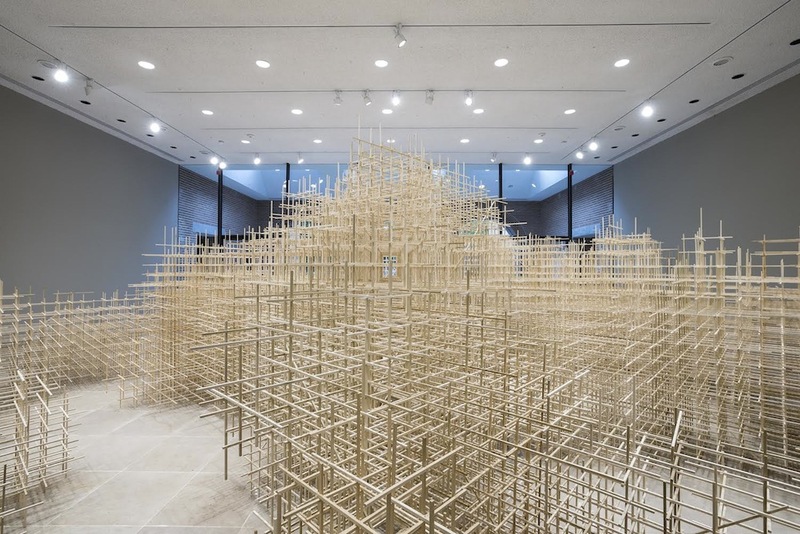 This immersive sculpture retains an organic feel because of its irregular shape and because of its material (over 10,000 pieces of poplar wood) and despite being composed of simple, regular, repeated shapes. Ben Butler, Unbounded, 2015. Image from Colossal. See link above. 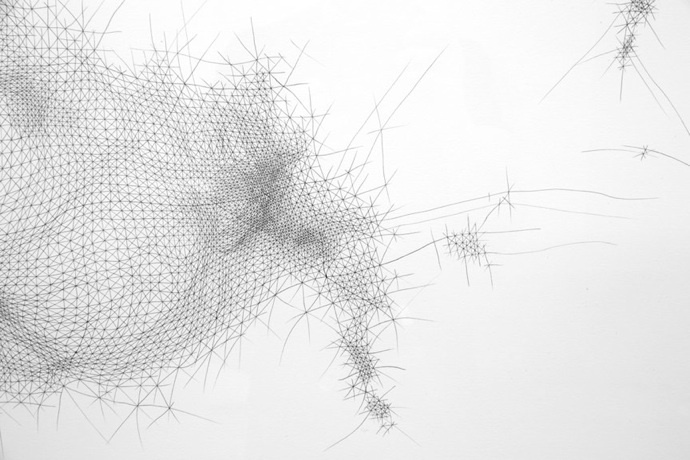 Once you’ve gotten a good look at Unbounded, head over to Butler’s website and take a look at his drawings and prints such as Invention #58 (detail) shown below. These make me wonder how we can make the Pointwise software do that. Ben Butler, Invention #58 (detail), 2011. Image from BenButlerArt.com. See link above. BONUS: The science of melting cheese. Because delicious. This entry was posted in Applications, Events, News, Software and tagged CAESES, Femap, Flow Science, FLOW-3D, Intelligent Light, jobs, meshing, scSTREAM, simFlow, Software Cradle, visualization. Bookmark the permalink.